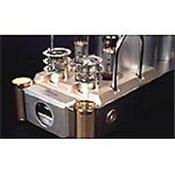 Tube Mono Block amplifiers. These 50wpc.amps use EL34, 6N8 and 6N9 tubes and have a synchronized remote volume control. The best buy tube amp! Low price and very sound! Music is MUSIC in Shanling reprodution. Very sinergy with my speakers who are Verity Audio Tamino X2. My CD Player is a Shanling SCD-T200C. Interconnects are WireWorld Silver Eclicspe and Speaker Cable is an Audioquest Sterling.